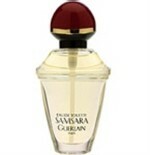 Guerlain introduced Samsara in 1989. It's fragrant nature explores essences of bergamot, peach and lemon. Blended with notes of jasmine, ylang-ylang and vanilla. Samsara is recommended for romantic use. I been using Samsara since 1989, when it first came out. I LOVE it! I get many, many, compliments when I wear Samsara. Everyone knows its me! I absolutely love this fragrance. Any man who smells it loves it also! My son always says you smell great mom! I have always received a compliment when wearing it out to dinner or a get together. Have used this scent for years. It's mine for sure! Constantly get comments like "You smell amazing" and "What's that scent you are wearing?" Will wear it as long as I can find it! I use Samsara daily and get tons of compliments on the scent. It is my signature scent. At work, people who start to come into an area where I am say, "Cat, are you in here?" I reply, "yes ---- and they say, "I knew it because I could smell you". My favorite scent; have been wearing it for years and I get many compliments on the scent---it is my signature perfume.